A lovely-looking, powerful little board. Though we wont see its true worth until M.2 and Devils Canyon come knocking. Surely it follows that with a new chipset should come new chips, right? And with Intel's latest motherboard chipset, the Z97, having just launched promising support for both the Devil's Canyon Haswell CPU updates and the next-gen Broadwell die-shrink, it's hugely disappointing not to be sat here extolling the virtues of some fine new processors too. But what can the new Z97 chipset offer in this first Republic of Gamers Maximus VII Hero board from Asus? Well, to be fair to them quite a lot, but very little of it is actually related to Intel's latest chipset. 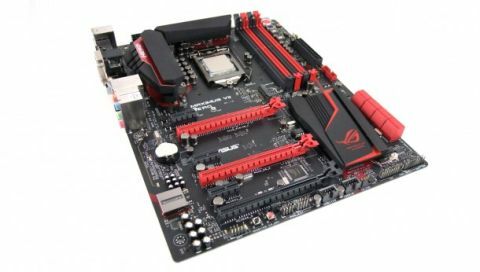 Right now these Z97 boards are going to live or die by their feature sets, and in typical RoG fashion Asus has thrown not just the kitchen sink, but an entire Magnet showroom at the Hero. What the new chipset offers over and above the previous Z87 is the ability to run the incoming Devil's Canyon Haswell chips as well as provide compatibility for Broadwell processors some time next year. The other big ticket item is that it also provides some PCIe lanes for the new M.2 format of PCIe-based SSDs. That could be big news as the new M.2 drives are going to be all the rage in the mobile sphere, and the prospect being able to plug the same speedy boards of Flash into our mobos for lightning boot drives is tantalising. The promise is that with a pair of PCIe lanes they should be able to deliver up to 1GB/s performance, topping the 600MB/s maximum SATA can offer at the moment. Unfortunately the only M.2 drives around at the moment are still based on the SATA spec and so can't live up to their M.2 billing. That means we're still waiting for any hardware to make the Z97 chipset's two new features in any way relevant. But this RoG Maximus VII Hero can offer much, much more. Most of it is aimed directly at gamers. Where to start? Well, there's the new SupremeFX onboard sound card, offering physical shielding from the rest of the board to cut out the electro-hiss you can get through headphones, as well as a bunch of audiophile extras like high-end audio capacitors and a hefty software suite. Another neat gaming addition is the Keybot microprocessor on the board. Simply plug your basic keyboard into the specific USB port and through the Keybot utility you can assign whatever macros you want to any of the function keys on your board. You can also set up some function keys to wake your machine up with different overclocking profiles should you so wish. But what about performance? Sadly that seems to have little relation to the motherboard these days. Either everyone's mobos are just as good or the CPU and GPU have far more bearing over how well your system performs. Overall there's little performance difference between this Hero and the Z87 version. There's no improvement in gaming performance or overclocking—i7 4770K is still locked at 4.7GHz as a maximum. Considering that it's the exact same price as the board it's replacing it's not really much of an issue, though £165 / $270 is still a lot of money for a mobo. It remains a great board though, with a beautiful, angular aesthetic and a seriously healthy feature set too. If you'd been thinking about a Z87 board before, then you'd have to shift over to Z97. If you're thinking of replacing a Z87 board, however, there's little reason in any of them right now to make the change worthwhile. That may change when Devil's Canyon finally breaks cover, but we'll see come June.